Taco seasoning from the store is convenient, yes, but it is also loaded with sodium. Making your own taco seasoning in bulk is not only easy, typically taking less than 5 minutes, but tastes delicious and can be salt-free. "Why the hell haven't I been making my own taco seasoning all along? That was so easy!" Making my own taco seasoning came from necessity and my needs to stick to a low-sodium diet. I was shocked how simple it was, and used ingredients I already had in my pantry. I have since evolved my basic recipe to add a little more refined flavors and varying degrees of spice. This is a somewhat spicy seasoning but can be altered for taste by reducing the red pepper flakes and black pepper for those who perhaps don't enjoy spicy food as much as myself, or in my case, I usually do a heaping amount of red pepper flakes because I like my tacos on the hotter side. 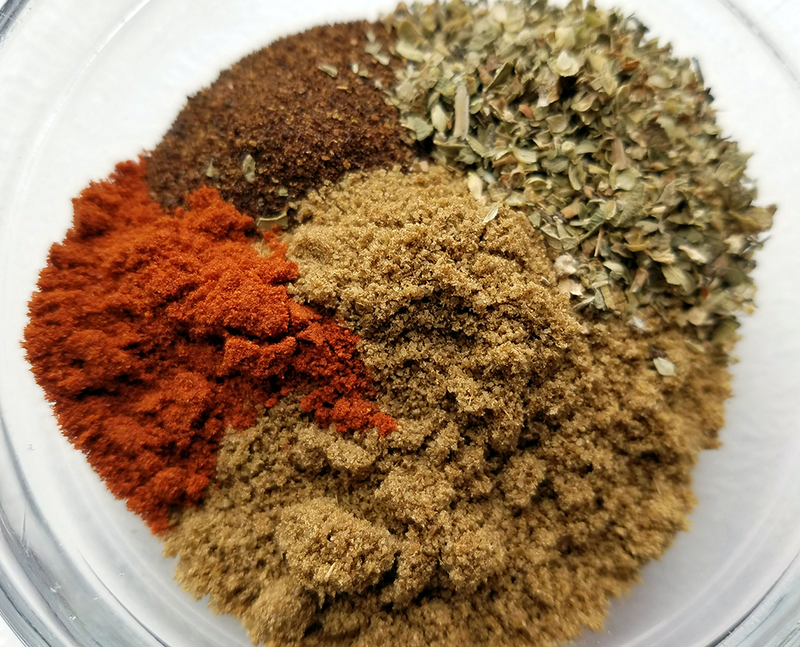 This seasoning mix can be used for tacos (just add a little salsa), enchilada sauce (just add a lot of tomato sauce), a fajita mix (don't add anything) or as a rub (spicy breakfast potatoes anyone?). The possibilities are endless, and if it is Mexican food, this taco seasoning can typically do the job. I make this is bulk because I like to have it on hand all the time - I eat a LOT of Mexican food! Double this recipe for nearly a cup of seasoning. For some perspective on quantity, when you make tacos, you'll want to use 1 tablespoon per pound of vegetables (or ground meat if that is your thing). I am using organic ingredients. Mix all into a mason jar, put on a lid and shake well to fully mix. Store in the jar, in a cool cupboard for up to one year. If you don't have a mason jar, you can use mix in a bowl and put into Tupperware or any sealed container. I have often used old dairy-free Sorbetto containers from Talenti - have some dessert and reuse the container for taco seasoning! To use this for tacos, simply add 1 tablespoon of the taco seasoning to 1 pound of cooked vegetables. Also add 3 heaping tbsp salsa (for a little moisture to bring it all together), and 1 tbsp fresh cilantro. Stir to combine and serve.